Allegations are flying high that Rohith Vemula, one of the five rusticated Dalit students of the University of Hyedabad, who committed suicide on Sunday, was the direct victim of powerful forces attached with the Sangh Parivar, including a minister of the Narendra Modi government, to suppress them for holding their strong political views. Found dead hanging in his room in the afternoon, he, along with other four, was sitting on dharna in the campus for 10 days after they were forced to vacate their hostel rooms. 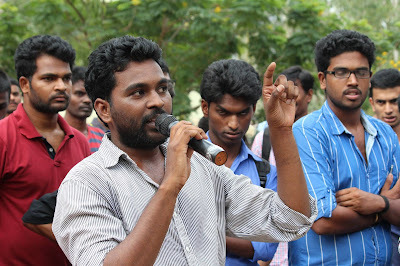 The Asian Human Rights Commission (AHRC), for instance, believes that the trouble started in August 2015 the Ambedkar Students’ Association (ASA), a leading student wing, which organised a protest march on the campus against the attack on the Montage Film Society in the Delhi University by Akhil Bhartiya Vidyarthi Parishad (ABVP) for screening a documentary movie ‘Muzaffarnagar Baaqi Hai”, which alleges role of Hindutva outfits in the 2013 riots. “Local ABVP unit did not like the protests and its leader Susheel Kumar posted a comment on Facebook calling ASA members ‘goons’. He later submitted a written apology. Next morning, Susheel Kumar alleged that about 30 students belonging to the ASA had beaten him up and he had to be hospitalized”, AHRC senior activist Samar says in an article. Yet, citing the incident, Bandaru Dattatreya, Secunderabad MP and Union labour and employment minister, declared, in a letter to Smriti Irani, Union minister for human resources and development, that the University of Hyderabad had become a “den of casteist, extremist and anti-national”. 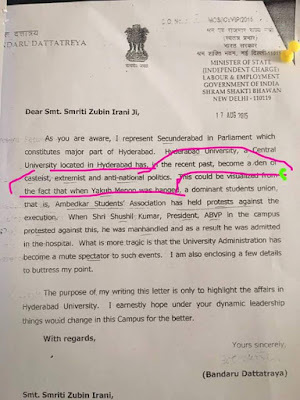 Subsequently, a new vice-chancellor was appointed, Prof P Appa Rao, who, without constituting any fresh enquiry, called Executive Council meeting, which decided to suspend the students and expel them from their hostels. If a student has been expelled/rusticated months ago, he could have preferred an appeal to the concerned authority, gone to the media showing his dalit card which definitely evoked enough response and publicity. Then these so called political parties who in any case have no agenda except to oppose the ruling party would have jumped into the fray and shouted about the intolerance in the country and filled reams of news papers and miles of television/social media footage. What kind of an individual this research scholar is, who does not have the mental fortitude to fight the injustice if any done to him but commits suicide like a lesser mortal.